This article originally appeared as a joint publication at TomDispatch.com and Truthout.org. To stay on top of important articles like these, sign up to receive the latest updates from TomDispatch.com. For Americans, it was like the news from nowhere. Years had passed since reporters bothered to head for the country we invaded and blew a hole through back in 2003, the country once known as Iraq that our occupation drove into a never-ending sectarian nightmare. In 2011, the last US combat troops slipped out of the country, their heads “held high,” as President Obama proclaimed at the time, and Iraq ceased to be news for Americans. So the headlines of recent weeks—Iraq Army collapses! Iraq’s second largest city falls to insurgents! Terrorist Caliphate established in Middle East!—couldn’t have seemed more shockingly out of the blue. Suddenly, reporters flooded back in, the Bush-era neocons who had planned and supported the invasion and occupation were writing op-eds as if it were yesterday, and Iraq was again the story of the moment as the post-post-mortems began to appear and commentators began asking: How in the world could this be happening? Iraqis, of course, lacked the luxury of ignoring what had been going on in their land since 2011. For them, whether Sunnis or Shiites, the recent unraveling of the army, the spread of a series of revolts across the Sunni parts of Iraq, the advance of an extremist insurgency on the country’s capital, Baghdad, and the embattled nature of the autocratic government of Prime Minister Nouri al-Maliki were, if not predictable, at least expectable. And as the killings ratcheted up, caught in the middle were the vast majority of Iraqis, people who were neither fighters nor directly involved in the corrupt politics of their country, but found themselves, as always, caught in the vice grip of the violence again engulfing it. All the dangers faced by Iraqis from the occupation—arrests, torture, car bombs, and sectarian violence—those killings have become like a toy in comparison to what we are facing these days. Fighting has spread in all directions from the north, east, and west of Baghdad. Much of the fighting is between the government and Sunni insurgents who have suffered a lot from the injustice of Maliki's sectarian government. As a result of this fighting, we can't sleep because of our fear of the uncertainty of the situation, and because of the random arrests of innocent Sunni people. Each day I awake and find myself in a very hard and bad situation and now am trying to think of any way I can to leave here and save my family. Most of my neighbors left back when it was easier to leave. Now, we have both the US and Iran helping the Iraqi government, and this will only make the fighting that is going on across Iraq much worse. Life in Iraq has become impossible, and even more dangerous, and there is now no way to leave here. To the north, west, and east of Baghdad there is fighting, and with so many groups of Shiite militias in the south, it is not safe for us to go there because of the sectarianism that was never here before the invasion. The price for bus tickets has become very expensive and they are all booked up for months. So many Iraqi families and I are trapped in the middle now. Every day, the Iraqi army is raiding homes and arresting many innocent people. So many dead bodies are to be found at the Baghdad morgue in the days following the mass arrests in Sunni areas. He concluded his email on a stark note, reminiscent of the sorts of things I regularly heard when I was in Iraq covering the brutal results of the US occupation. “Horror, fear, arbitrary arrests, indiscriminate bombing, killing, an uncertain future—this is the new democratic Iraq." And don’t for a second think that this summer it’s just Sunni communities who are living in fear. Claims of massacres and other atrocities being carried out by the Islamic State of Iraq and Syria (ISIS), the group spearheading the Sunni revolt across the northern and western parts of the country, abound along with well-documented accounts of their brutal tactics against Shiites. In one incident, according to witnesses, ISIS forces kidnapped at least 40 Shia Turkmen, blew up three Shia mosques and another Shia shrine, and raided homes and farms in two Shia villages near the city of Mosul. And that’s just to start down a long list of horrors. Meanwhile, the sectarianism shredding the social fabric is being stoked further by the posting of images online that show at least 10 ancient Shiite shrines and mosques destroyed by ISIS fighters. As for myself, I can’t claim to be surprised by the events of recent weeks. Back in March 2013, on a visit to the embattled Sunni city of Fallujah (twice besieged and largely destroyed by US troops in the occupation years), I saw many signs of the genesis of what was to come. I was at one point on a stage there alongside half a dozen tribal and religious leaders from the area. Tens of thousands of enraged men, mostly young, filled the street below us, holding up signs expressing their anger toward US-backed Prime Minister Maliki. Having written about the myriad human rights abuses and violations Maliki's regime was responsible for, I was intimately familiar with the way the bodies, dignity, and rights of much of the Sunni population in Fallujah’s province, al-Anbar, had been abused. That same month, I had, for instance, interviewed a woman who used the alias Heba al-Shamary and had just been released from an Iraqi prison after four grim years. That very month, Amnesty International released a report that highlighted what it called "a grim cycle of human rights abuses" in Iraq. When I was in Baghdad, it was common to hear Maliki referred to in many areas as "worse than Saddam [Hussein]." In late 2012, the young among the politically disenfranchised Sunni population began to organize peaceful Arab Spring-style rallies against the government. These were met with brute force and more than a dozen demonstrators were killed by government security forces. Videos of this went viral on the Web stirring the already boiling tempers of youths desperate to take the fight for their rights to Baghdad. “Maybe armed struggle comes next,” he replied without a pause. Maliki’s response to the Fallujah protests would, in fact, insure that the sheikh’s prediction became the region’s future. The adrenaline-pumping energy on stage and in the crowd that day mixed electric anticipation and anxiety with fear. All of this energy had to go somewhere. Even then, local religious and tribal leaders were already lagging behind their supporters. Keeping a lid on the seething cauldron of Sunni feeling was always unlikely. When a tribal sheikh asked the crowd for a little more time for further “diplomacy” in Baghdad, the crowd erupted in angry shouts, rushed the stage, and began pelting the sheikhs with water bottles and rocks. In pockets of that crowd, now a mob, the ominous black flags of ISIS were already waving vigorously alongside signs that read "Iraqis did not vote for an Iranian dictatorship." Enraged shouts of "We will now fight!" and "No more Maliki!" swept over us as we fled the stage, lest we be hit by those projectiles that caught the rage of the young, a rage desperate for a target, and open to recruitment into a movement that would take the fight to the Maliki regime. Funded by Arabian Gulf petrodollars from Qatar and Saudi Arabia, among other places, and for a long while supported, at least implicitly, by the Obama administration, radical Islamist fighters in Syria opposing Bashar al-Assad have been expanding in strength, numbers, and lethality for the last three years. This winter, they and their branches in Iraq converged, first taking Fallujah, then moving on to the spring and summer debacles across Sunni Iraq and the establishment of a “caliphate” in the territories they control in both countries. It was hardly news that ISIS, a group even the original al-Qaeda rejected, had a strong presence in Syria. Secretary of State John Kerry spoke of the situation defensively last fall in attempting to explain Washington’s increasingly controversial and confused policy on Syria, the rebels, and the regime of Bashar al-Assad they were trying to fell. He described the "bad guys" as radical fighters belonging to ISIS and al-Qaeda-affiliated groups, calling them the lesser part of the opposition in that country, a statement that even then was beyond inaccurate. He went on to describe those "bad guys" as having "proven themselves to be probably the best fighters… the most trained and aggressive on the ground." Of course, Kerry claimed that the US was only supporting the "good guys," another convenient fiction of the moment. Fast forward to just a few weeks ago: in a meeting with Syrian opposition leader Ahmad al-Jarba, Kerry proposed arming and training supposedly well-vetted "moderate" Syrian rebels to help take the battle to ISIS in Syria but also in Iraq. "Obviously, in light of what has happened in Iraq," he said, “we have even more to talk about in terms of the moderate opposition in Syria, which has the ability to be a very important player in pushing back against [ISIS’s] presence and to have them not just in Syria, but also in Iraq." The confusion of this policy remains stunning: Washington hopes to use "moderate" Syrian rebels, in practice almost impossible to separate from the extreme Islamists, "in pushing back against" those very Islamists, while striking against the Assad regime which is supporting—with air strikes, among other things—the Maliki government which Washington has been arming and supporting in Iraq. The US has already invested more than $25 billion in support for Maliki—at least $17 billion of which was poured into the Iraqi military. Clearly that was money not well spent as that military promptly collapsed, surrendering a string of cities and towns, including Tal Afar and Mosul, when ISIS and other Sunni insurgents came knocking. More aid and personnel are now on the way from Washington. The Obama administration already admits to sending at least an extra 750 Marines and Special Operations troops into Iraq, along with missile-armed drones and Apache helicopters. It is now pushing hard to sell Iraq another 4,000 Hellfire missiles. The Pentagon insists its troops in Baghdad are either guarding the huge US embassy or serving in an "advisory" capacity to the Iraqis, but is also claiming that its forces need "flexibility" in order to carry out their missions. As a result, there are already plans for US pilots to fly those Apache attack helicopters there. While Washington might be at odds with Russian President Vladimir Putin over the crisis in Ukraine, the Obama administration is undoubtedly breathing a sigh of relief that Russian military aid, including fighter planes, is now flowing into Baghdad. Blurring opaque political alliances further, Iran has supplied Iraq with ground attack jets, has drones carrying out reconnaissance missions over the country, and Iranian Kurds could be joining the fight on the ground. Considering all these twists and turns of the Iraqi situation, political analyst Maki al-Nazzal shared these thoughts with me, which are increasingly typical of Sunni opinion: "Iraq is still suffering from the US occupation’s sins and now self-operating to remove the cancer the US planted in its body. Iraqi nationalists and Sunni Islamists have had enough of being wasted through 11 years of direct and indirect occupation and so revolted to correct by guns what was corrupted by wrongful politics." Meanwhile, the ongoing crisis has sent the government in Baghdad into free-fall just as the opportunistic Kurds of northern Iraq have called for a referendum in the next two months to address a long-fostered desire to become an independent country. Given all of this, hopes for any kind of Sunni-Shia-Kurdish “unity” government that could save the country from collapse have been repeatedly dashed. Making matters worse, with thousands of Iraqis being slaughtered every month and the country coming apart at the seams, even the Shiites in the country’s parliament seem deadlocked. "Things are moving faster than the politicians can make decisions," a senior Shiite member of parliament told a reporter. No wonder the Iraqi army won't stand its ground when facing ISIS fighters, who are more than willing to die for their cause. What exactly is it to die defending? And it's not just army troops who are refusing to put their lives on the line for Nouri al-Maliki. Powerful Sunni tribal leaders in Iraq's volatile Anbar Province are also refusing to fight for Maliki, too. In a recent interview, Sheikh Hatem al-Suleiman, head of the Dulaimi tribe, insisted that Maliki was more dangerous than the ISIS fighters, adding, "I believe that Maliki is responsible for ISIS coming to Iraq." Washington’s man in Baghdad for so long, Maliki himself now adds to the crisis by refusing to budge, no matter the pressure from his former patrons and Shiite religious leaders. The disintegration of Iraq is the result of US policies that, since 2003, have been strikingly devoid of coherence or any real comprehension when it comes to the forces at play in the country or the region. They have had about them an aura of puerility, of "good guys" versus "bad guys," that will leave future historians stunned. Worst of all, they have generated a modern-day Middle Eastern Catch-22 in which all sides are armed, funded, and supported directly or indirectly by Washington or its allies. Meanwhile, ISIS and other Sunni insurgent groups have effectively tapped into the tens of thousands of angry young men I saw in Fallujah last year and are reportedly enjoying significant popular support (as, in some cases, the best of a series of terrible options) in many of the towns and cities where they have set up shop. Words cannot explain what we are suffering now. I do not believe what is happening to us. 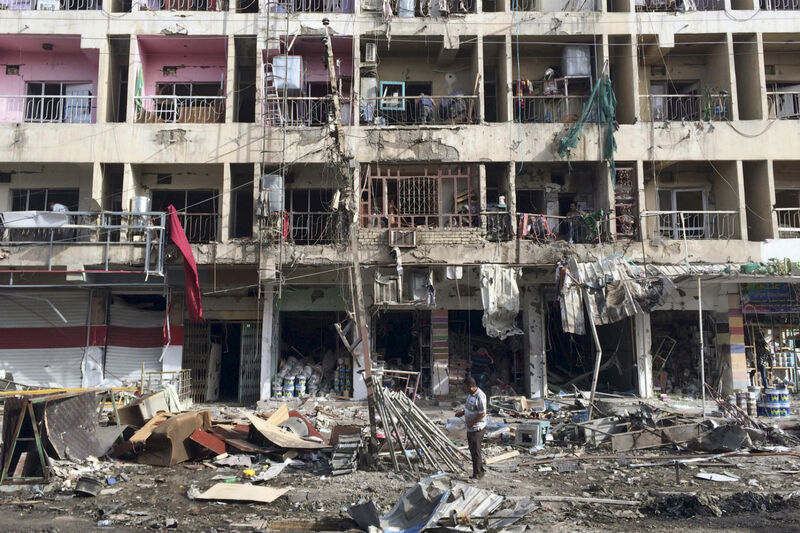 Imagine a life lived in permanent fear, with shortages of all-important services like electricity, water supply, fuel, and food in the very hot Iraqi summer and during the fasting month of Ramadan. The most important part of the whole story is that all of these tragedies are happening—and let me say with sadness, are happening while we are now refugees and deprived of our houses and belongings. Fleeing Maliki's bombardment, we travelled to Anah City [northwest of Fallujah and closer to the Syrian border] seeking safety, but now Anah has become unsafe and was attacked twice by Syrian helicopters, which killed five Fallujan civilian refugees. Everything in our life is sad and difficult. We are under the control of senseless criminals. As Iraq's disintegration into darkness progresses, it sickens me to think of all the Iraqis I met and became friends with, who have since been killed, disappeared, or have become refugees. What is left of Iraq, this mess that is no longer a country, should be considered the legacy of decades of US policy there, dating back to the moment when Saddam Hussein was in power and enjoyed Washington’s support. With Maliki, it has simply been a different dictator, enjoying even more such support (until these last weeks), and using similarly barbaric tactics against Iraqis. Today, Washington’s policies continue in the same mindless way as more fuel is rushed to the bonfire that is incinerating Iraq.